The perfect indoor environment in any commercial building should address a variety of needs. These needs include maintaining high-quality clean air, improving personal comfort control, attenuating noise, responding to organizational and technological changes quickly and easily, and supporting the overall aesthetic value of the building – all while being cost-effective in both construction and operation. With Tate’s access floors and underfloor service distribution system, you have the ability to address all of the factors required to create the perfect indoor environment that will reflect the goals and image of your organization. Freedom of design is important to any architect or design firm who is considering raised floor on their project. 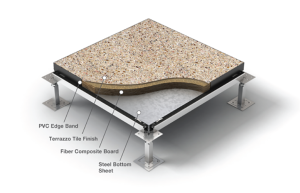 Access floors have emerged as a practical solution for numerous building types, not just the traditional office and data center settings with which they are most often associated. Tate has made a commitment to service the needs of both existing buildings and the new construction market by expanding their product offering to include new and exciting finishes. Unistrut/Tate offer Lunch and Learn Presentations on the benefits of raised access flooring, underfloor air, and other interesting topics. Contact our sales team to arrange a presentation at your company. Each presentation includes free lunch and CEU credits! Buy New and Used Raised Access Floor Here! Unistrut Midwest keeps a constant inventory of new and used access floor systems in stock. Whether you are looking for a new floor system for your data center or a few replacement tiles, Unistrut Midwest is your source for all your access floor needs.